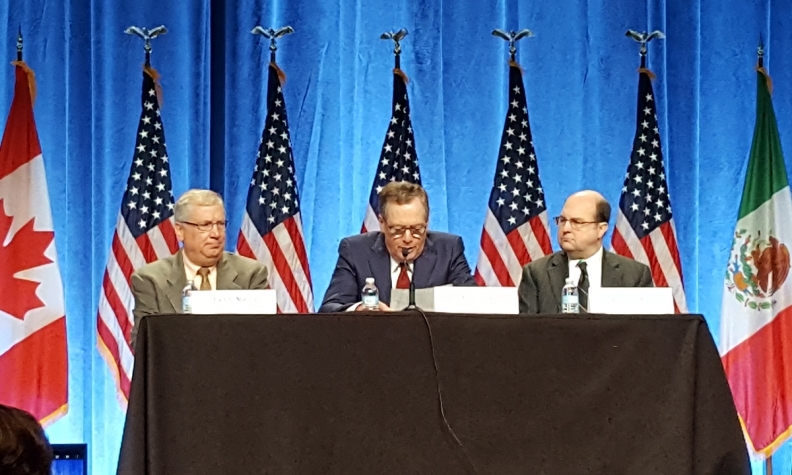 The U.S. NAFTA team, led by chief negotiator John Melle, assistant U.S. trade representative for the Western Hemisphere; U.S. Trade Representative Robert Lighthizer; and USTR general counsel Stephen Vaughn. U.S. officials in NAFTA negotiations are making proposals on battleground issues that Canada and Mexico would never agree to, intensifying doubts of reaching compromise on their tight timeline, according to three officials familiar with the talks. U.S. proposals on government procurement, textiles and fresh produce are seen by the Canadian and Mexican governments as red-line issues with little or no hope of agreement, said the officials, who spoke on the condition of anonymity because the discussions are private. The last round of talks that ended Wednesday in Ottawa took on a more negative tone at times compared with previous sessions, the officials said. The U.S. stance sets up a showdown in the next negotiating session in Washington from Oct. 11-15. Officials expect the United States will present contentious proposals on automotive rules of origin -- the share of a car that must be made in the three countries to get NAFTA's tariff-free benefits -- and on an overall U.S.-specific content requirement. They expect those will also be essentially impossible for the other countries to accept. The U.S. Trade Representative's office, which is leading the U.S. negotiations on NAFTA, didn't immediately respond to requests for comment made outside regular business hours. President Donald Trump has made cutting the trade deficit as the top-line goal of a NAFTA re-negotiation, and autos is the main source of America's $64 billion goods gap with Mexico. The administration launched the revamp in August by warning that a revised version of the deal that underpins US$1.2 trillion of trade annually must have better terms for American workers and industries. Two of the officials speculated that the United States is designing such hard-line positions to make it impossible to reach a settlement. Trump has repeatedly threatened to pull out of NAFTA, saying in an interview in April that he was "psyched" to terminate the deal but reconsidered after Canada and Mexico asked him to renegotiate instead. Commerce Secretary Wilbur Ross reiterated the threat earlier this month, adding that NAFTA "has not worked the way it was intended." U.S. Trade Representative Robert Lighthizer told reporters Wednesday that "significant progress continues to be made" in areas including competition, state-owned enterprises, digital trade and telecommunications. But he said "there is an enormous amount of work to be done, including on some very difficult and contentious issues." The parties are aiming to secure a deal before the political calendar fills up next year with presidential elections in Mexico and congressional mid-terms in the United States. On government procurement, the United States is proposing to cap its market for contracts at a dollar-for-dollar level with the combined Canada-Mexico market, according to the three officials. That would mean the total value of contracts the Canadians and Mexicans could access, together, couldn't exceed the total value that U.S. firms could win in those two countries, the officials said. Given the scale of the U.S. economy and population, this could effectively leave the two with less access to U.S. procurement than some other countries, the officials said. The United States is also said to be proposing to eliminate preferential tariffs on textiles from Canada and Mexico over two years -- an idea described by the officials as an assault on the sector in those countries. Finally, the United States wants to essentially open so-called "seasonal products," such as fruit, to dispute-resolution mechanisms that would be expected to lead to disputes with U.S. growers and possibly tariffs, which could hinder Mexican exports, according to two officials. The officials likened the potential fallout to the case of Boeing Co.'s challenge against Canadian-owned Bombardier Inc., which led to imposition of preliminary duties on Tuesday by the U.S. Commerce Department and will put a chill on the aerospace sector. If one of the three countries were to walk away from talks, a next step would likely be issuing a six-month notice of withdrawal from the pact, though that wouldn't guarantee an exit. Steps after that get murky -- trade powers in the U.S. are divided between Trump and the U.S. Congress. An attempted U.S. exit could trigger political and legal battles. Mexico and Canada have said they want a modernized NAFTA and have downplayed Trump's threats. "As the negotiations move forward, it is important we have the will to table positions that encourage constructive discussions," Mexican Economy Secretary Ildefonso Guajardo told reporters Wednesday. The third round of talks ended with an agreement on a NAFTA chapter related to small- and medium-sized businesses. The duty imposed on Bombardier while talks took place hung over the final day of discussions, with Canadian Foreign Minister Chrystia Freeland calling the U.S. "a protectionist administration" in relation to the issue.